^ DZUS Stud now 2" long exposed length = 1.75"
Ask Coleman about nameplate bezel L-M div. Talk to Leahney about wind tunnel test. check on two kinds of front seats one for console one without. Talk to Coleman about 428 Supercharged for C.S. Talk to Ford Motor Co.
Get OK to build as Preproduction. Coleman - Check on personalized nameplate bezel. Get model number of motor on sliding roof. Are Smith going to make installation drawings? "H.O. Smith"? Was the author just not fully informed as to the actual name of the company that was about to take over production of the Shelbys in just a couple weeks? DSO 8008 is not an actual DSO number. Pete Disher suggests the author is actually referring to DSO 8D2508, which is the 8th DSO for 1968 model year cars. "Coleman" is Don Coleman - he was also referenced on these handwritten notes. A luxury Shelby Cougar? Indeed! It was long-known that the 1968 Cougar XR-7G program was initially assigned to Shelby, but this document taught us that Shelby American (Los Angeles) was involved at least as early as the spring of 1967. 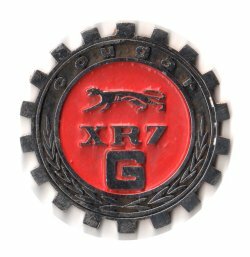 It also enlightens us that this performance cat was originally going to be named the XR-7S ("S" for Shelby), and like its Mustang-based G.T. sibling, the Cougar XR-7S was to receive fiberglass body styling modifications, including fender extensions and a special hood to set it apart from Ford's regular production Cougars [these may be what item #5 of the VanAkin letter references]. We've found other documentation that tells us a 428 with dual 4bbl carburetion would be available on the XR-7S. In October 1966, Ford stepped in and took control over ordering and engineering at Shelby American. Six months later in May 1967, Ford decided to terminate the Shelby Program. By the time the performance cat would have entered production, Shelby was no more; the "S" suffix reference was dropped and the special 1968 Cougar model was named the XR-7G ("G" for Gurney) -- after all, they already had promotional pictures of Gurney posing with the XR-7S photographic car, and they'd previously used his name for the Dan Gurney Special. The fiberglass fender extension modifications and the European radio never made it to the production models. We know at least one 'prototype' example of the XR-7S was built and a second one built for Henry Ford II. The HF II's XR-7S still exists. Hopefully someday our continued and relentless research will uncover some concept sketches of the XR-7S -- that would be a great day!